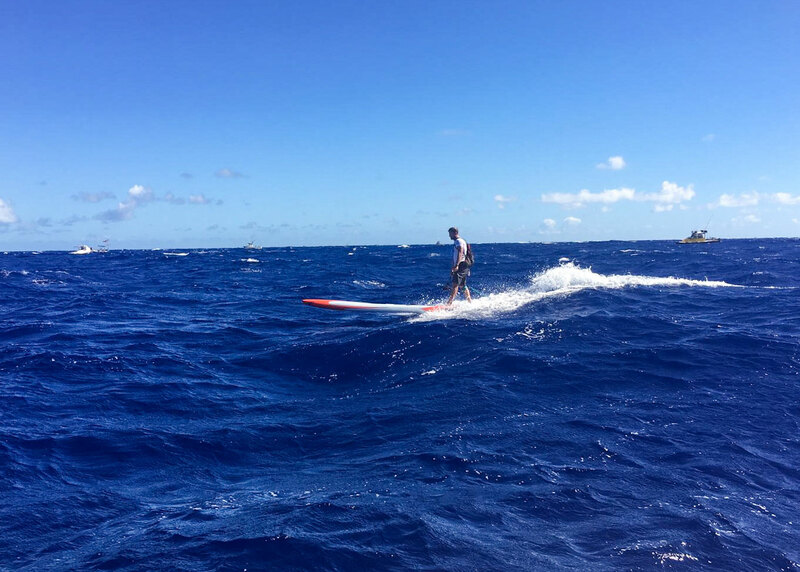 After an almighty, see-sawing battle that lasted almost the entire 32 miles from Molokai to Oahu, Travis pulled away in the final kilometre to claim a victory that will become an instant classic in the history pages of our sport. As the clear favourites heading into the race despite a record number of genuine title contenders this year, Trav and Connor broke free from the field in the second half of the race but could never drop each other, hitting the iconic ‘China Walls’ that marks the entrance to Oahu and the final one and half mile upwind grind to the finish line literally side-by-side. The pair could not be split until Trav found something extra to open up a slight gap, at which point he put the hammer down and charged away into the upwind flats towards the finish line at Hawaii Kai to leave Connor in his wake. The victory leaves no doubt that Travis, who has won everything from Carolina to the BOP and virtually everything in between, will be remembered as one of the sport’s all-time greats. Connor, despite missing out on the crown that he’s been trying to regain ever since he last ascended the Molokai throne back in 2014, deserves huge wraps. It was a gutsy performance from a scrappy fighter that always goes about his business with a minimum of fuss but continually proves why he’s almost-permanently sitting on top of the world rankings leaderboard. The fact that Connor was narrowly leading halfway down China Walls suggest that if the race was 31 miles instead of 32, he may have won. But in the end, the world number one had to settle for being world number two today. Much has been said of the Connor/Kai rivalry in our sport over the past half a decade, but Connor and Travis now have one that arguably surpasses that in terms of scale and grandeur. Today’s epic duel mirrors the side-by-side battle these guys first played out across the Ka’iwi Channel back in 2014, where Connor won by a minute and they both set record times (just as they did today: Connor’s time of 4:03:46 would have been a record itself if not for Travis’ heroics). Behind the lead duo it was also a titanic struggle for the minor placings, with Travis’ NSP and Quickblade teammate Titouan Puyo outlasting Sunova’s James Casey to claim the third step on the podium, while it was a spirited performance from Brazil’s Vinni Martins to close out the top five ahead of one of the pre-race favourites Lincoln Dews. All of these guys paddled hard enough today to win just about any other race in the world, and they all deserve huge accolades. Titou’s superb finish, which is particularly impressive considering he rarely races on unlimiteds and is still getting accustomed to using a rudder, gives NSP and Quickblade a memorable double-podium that almost matches their famous 1-2 finish at Carolina earlier in the season. 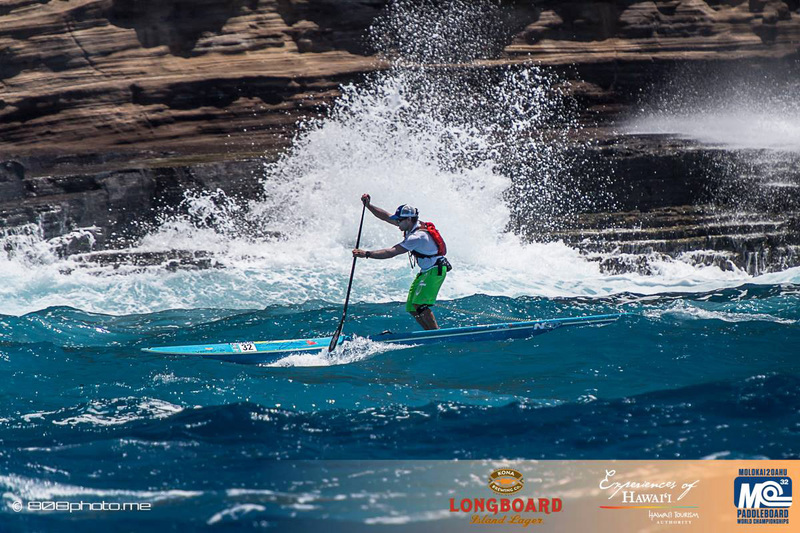 Maui’s Kody Kerbox finished 7th just a few minutes further adrift in a mighty impressive showing for a guy that’s had such a light competition schedule this season. 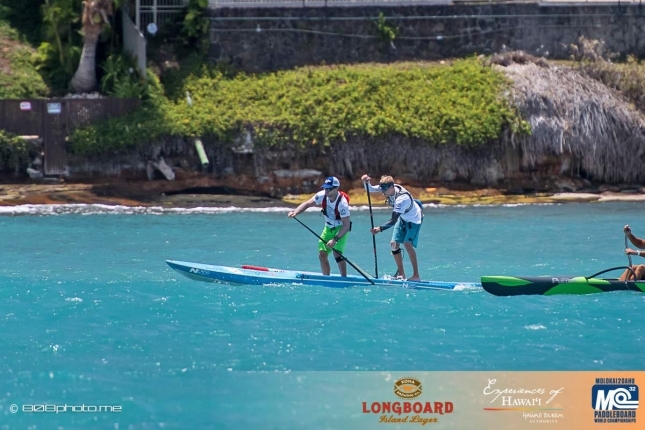 Josh Riccio snuck home 8th across the line but as a clear winner of the 14′ stock division after he relished the downwind bumps (see the pic of Josh down the bottom), while Team Sunova board designer Marcus Tardrew was 9th overall just one second behind Riccio. With five or six clear title contenders on the start line, the opening stages of Molokai 2017 lived up to the hype of being the most competitive and unpredictable edition of this uber-prestigious event. At the halfway mark of the channel crossing and with the wind howling and conditions firing, there were still six or seven guys in contention for the win. After Lincoln led early, Travis and Connor soon took over to control the tempo, however Linc was never too far behind nor was fellow Aussie James ‘Jimmy’ Casey. Titou was taking a more northern line but held a virtual 3rd spot just a hundred metres or so behind Connor and Trav, while Vinni surged at around the 13 mile mark to close the gap on the leaders and threaten to break onto the podium. Kody was also still within sight of the leaders at this point. But as the race entered its third hour and the arms, legs and minds of these incredible athletes started to tire, it was the two favourites, who went into today’s race holding five of the previous six Molokai titles between them, who showed their true class to begin slowly but surely pulling away from the other contenders. With defending champ Kai Lenny in Mexico for the WSL big wave event (and with rumours swirling that he may have foiled the channel even if he was in Hawaii) it seems there was always going to be a fresh champion this year. But whether that would be a previous winner or a new name was hotly debated in the days leading up to the big dance. But after Titou, Jimmy, Vinni, Lincoln and Kody threw everything at them, in the end, Travis and Connor showed why they’re considered two of the all-time greats in our sport. 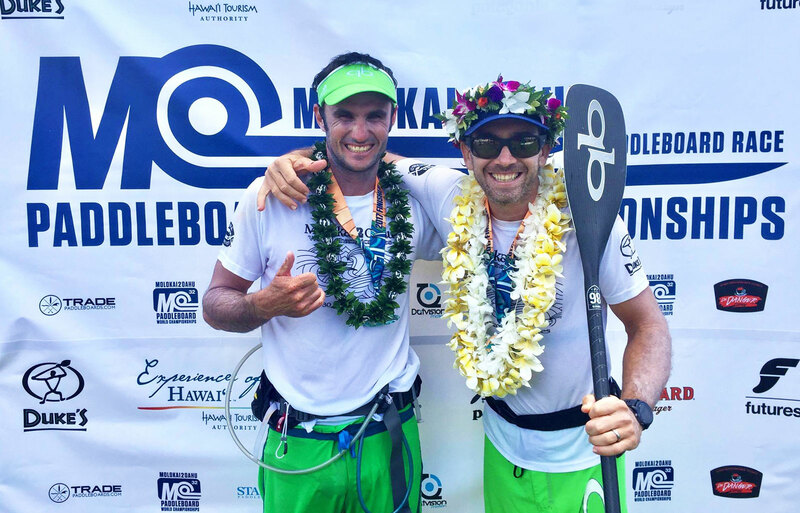 Trav’s third Molokai title also pulls him up alongside Connor (and Sonni Honscheid) as the winningest SUP athletes in the event’s history. 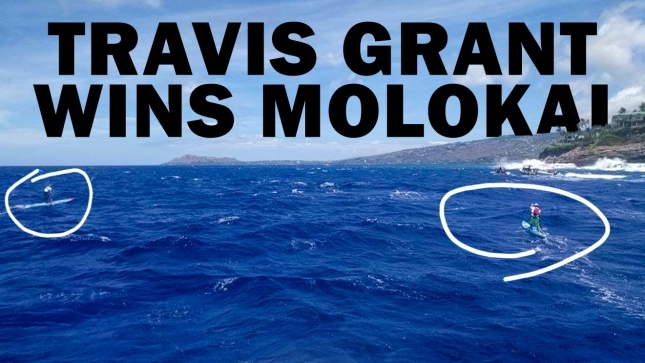 We’ll have more insights from this historic showdown in the days ahead, but in the meantime, there’s plenty more coverage over on the Molokai2Oahu Facebook page. UPDATE: There are now 400+ great photos from today’s crossing up on Facebook. I’ve also gotta say a massive thank you to Alain Teurquetil, the head designer of NSP who made the winning board for Travis, for sending us live play-by-play updates across the channel and keeping us in the loop with regular photos and videos as the epic duel unfolded. Cheers mate! 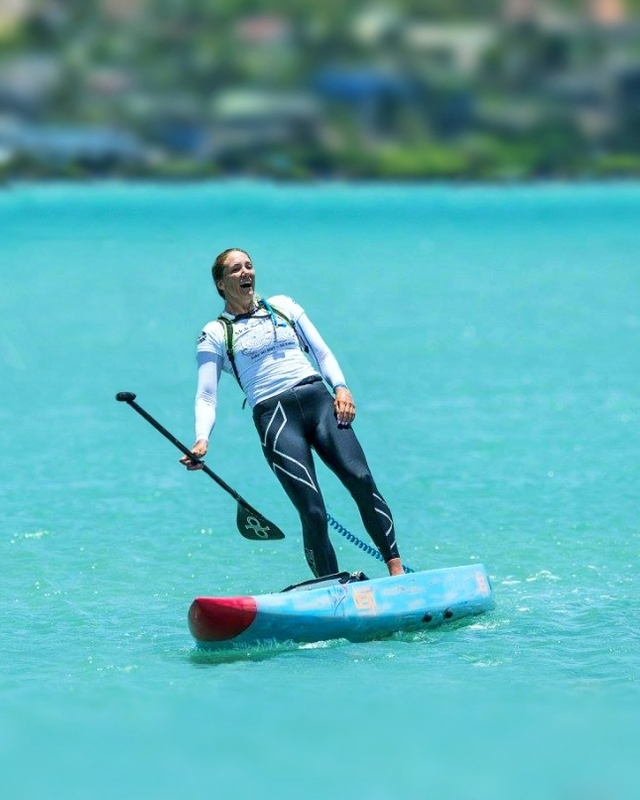 UPDATE: New Zealand’s Penelope ‘Pea’ Strickland has just crossed the line to claim the 2017 women’s Molokai-2-Oahu crown, upsetting her compatriot, world number one and red hot favourite Annabel Anderson while also matching Travis’ efforts in setting a new race record. 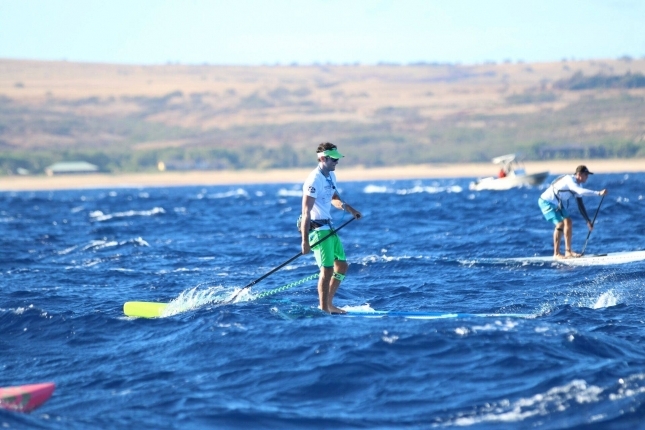 Pea crossed in a time of 4 hours 52 minutes, which not only breaks the record by a few minutes it also puts her top 10 in the men’s field in what is surely one of the greatest performances Molokai has ever seen. This is an absolutely massive result for Pea, who started the race this morning as a huge underdog despite having podium’d at Molokai twice before. After three-time defending champ Sonni Honscheid withdrew from the race, Annabel assumed pole position but ended up trailing her fellow Kiwi the entire way across the channel. Elsewhere in the race, downwind wunderkind Bernd Roediger partnered with Naish veteran Michi Schweiger to upset the dream team of Mo Freitas and Andrew Logreco in the battle for the teams title. Putting his world-beating downwind skills to good use in the firing conditions, Bernd propelled the duo to a big win in a time of 4:23:27, yet another race record that highlights just how good the conditions were this year (as well as just how competitive the M2O field has become). Logreco/Freitas were eight minutes further adrift. We did it! We won the 2-man SUP class, and came 8th overall! #naishteam 💪 thanks so much @michisilence for being an amazing race partner, and for showing me the Ka'iwi channel! 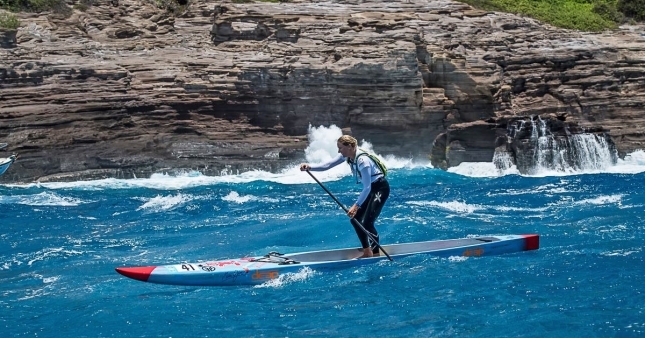 Young guns Lara Claydon and Kali’a Alexiou, who seem to be Molokai veterans despite not having even been born until the 4th or 5th annual edition of this 21-year-old event, teamed up once again and took top honours in a very impressive time of 5:33:07. That’s only just over 15 minutes off the pace of Terrene and Annabel, which is even more impressive considering the fact Lara and Kali’a were paddling a 14 footer. The young duo comfortably accounted for the far more experienced team of Andrea Moller and Devin Blish. Two time- 2 person women's relay Molokai 2 Oahu Champs! With a time of 5:33 hrs./sec and 32 miles. Amazing day in the channel with good downwind bumps! Couldn't have done it without my badass partner @lalaclaydon paddling so hard the entire way. I have to say this is the hardest race I've ever done yesterday but paddling out in the deep blue of the channel is one of the best feelings and I'm so grateful to be able to do this. Congrats to all the teams, solo athletes and my friends who crossed the channel on this record breaking day! 💙 #molokai2oahu2017 #m2o #kaiwe #backtoback #beatlastyear #quickblade #futuressup thank you @molokai2oahu ! 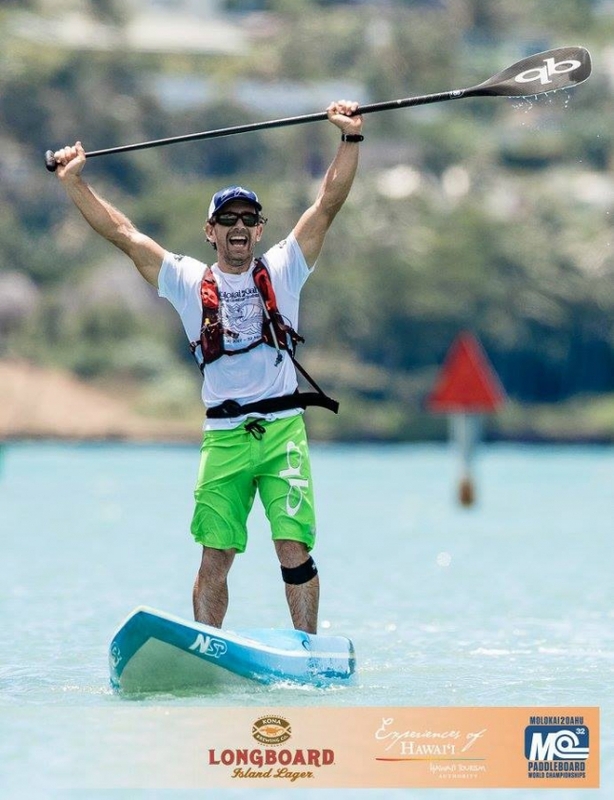 Completing the virtual clean sweep of race records was Matt Bevilacqua from Australia, who won the traditional prone paddleboard title (the division that started this whole Molokai-2-Oahu event way back in 1997, let’s not forget) in a time of 4:29:20, beating his record from last year by just 12 seconds. Bevilacqua finished 10 minutes ahead of compatriot Daniel Shade, while former champ Matt Poole was third. Not surprisingly, the entire top 10 was filled with Aussies, which included prone stock champion Stewart McLachlan and runner-up Lachie Lansdown. To make it three out of four solo Molokai titles for the Aussies this year, Harriett Brown pulled away from Lizzie Welborn in the second half of the race to claim her maiden Molokai crown and, you guessed it, set a new race record of 5:14:15, eclipsing Jordan Mercer’s record by almost 10 minutes. Yet another Australian, Madison Spencer, claimed the women’s stock division to make it a hugely triumphant day for the green & gold. Follow the official Molokai2Oahu Facebook for more coverage. You can also watch a full replay of the GPS tracking map to see exactly which line each athlete took across the infamous channel.